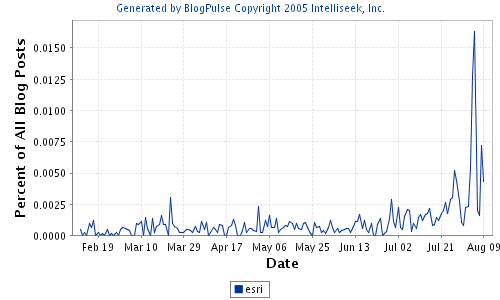 Its been a little over a month since I made my post about ESRI and the blog PR battle and I wanted to take another look to see how far they have progressed since then. 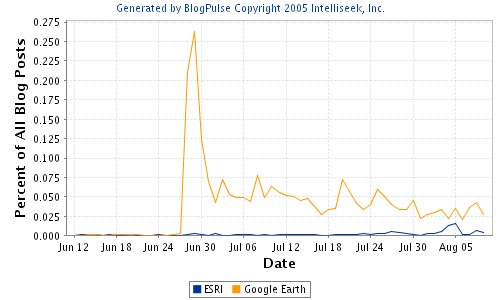 The previous blog post looked at how often the keyword “esri” was mentioned in blog posts vs “google earth” so I again visited Blogpulse. 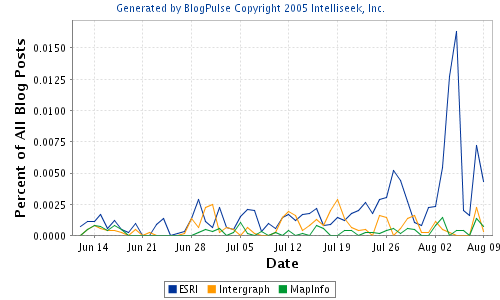 The previous graph looking at ESRI and Google Earth is below. 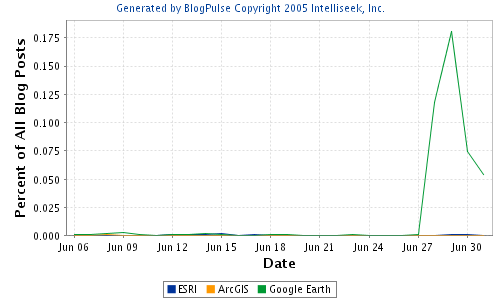 You still see that spike that Google Earth had right after its release, but now it has leveled off. 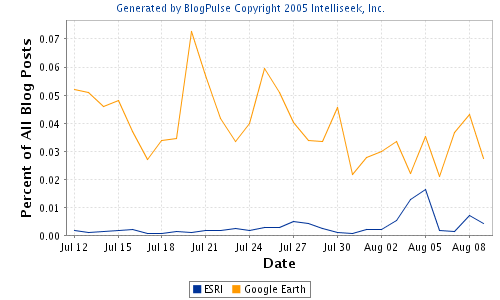 ESRI has actually risen since then, still below Google Earth but at a much higher level than before Google Earth was released. If we narrow the time down to the last month, you see a better look without that spike. Even if you take out that spike right after the User Conference, you can see that there are many more people talking about ESRI. You can’t really compare ESRI against companies such as Google and Microsoft, but lets take a quick look at Intergraph and MapInfo. I’ll revisit this again at the end of the year and we’ll see if there has been any more progress. One month isn’t that long to determine trends so we’ll want to check back to get a better read on the ESRI blog state. In researching this again, I stumbled across a very interesting blog called Data Mining which is sort of a GIS/Mapping/Statistics/Search/Blog Blog. Very good reading if you ask me. I’ve subscribed and I can’t believe I didn’t know about it sooner because there was some love for my previous post. Just goes to show, you’ll never know where you’ll see GIS these days.